Just had a Ferrero Rocher bunny sent from my sister in Italy. Not the one that contains the chocolates. It's like the Lindt one. Ferrero Rocher chocolate in the shape of a bunny. Empty inside. Do they sell them here too? 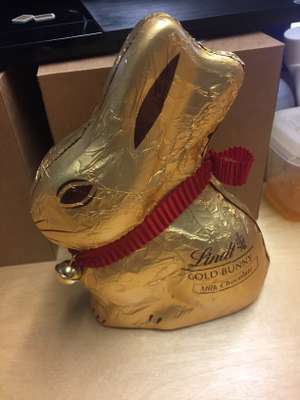 Got the 200g bunny from Waitrose for £1, so cold. Tiny bunnies 10p in Superdrug. Bags of Malteasers bunnies 49p.